The "state-of-the-art" in model railroad ground cover has gone from dyed sawdust to ground foam and now onto "static grass." This material is a fine filament that, when applied to the layout with a static electric charge, will stand vertically and represents fine blades of grass, weeds, or other plants. The material can also be applied to trees to represent pine needles and many other trackside details. Simulated grasses have been around for many years. You can even make your own from twine and other products. The challenge with these, however, is that each clump had to be planted individually by hand. This is fine for smaller applications, but planting an entire field can take hours and yield rough results. The static grass applicator and material make covering any area easy. The only downside for many modelers has been the high upfront cost of the tool. Typically, static grass tools are priced at about $130.00 (the cost of a new locomotive in many scales). If you have a large layout, the cost is certainly worth it. But what if you have a smaller layout or budget? Fortunately, these are not very complicated devices. With a little work and some basic skills, you can build your own in about 30 minutes and for around $10. Sieve: These can be found in a kitchen supply store or the home section of most department or discount stores. Alligator clip: Any hardware or electronics store should sell a small pack for a few dollars. Leftovers can be used to make test leads or just as convenient miniature clamps. Wire: You'll need approximately two feet of stranded wire. 18 gauge works well, but size is not critical (use whatever you have on hand from your layout). 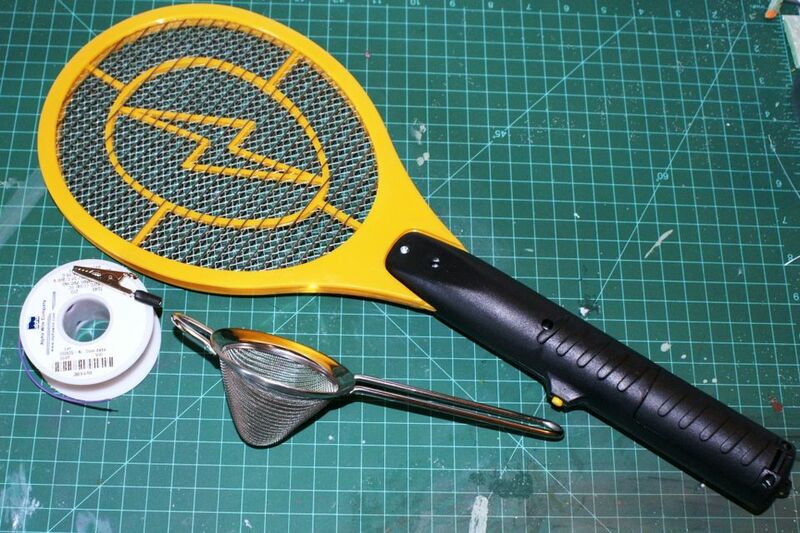 Begin by modifying the electric bug zapper. Unscrew the back of the handle to access the electronics inside. Make sure to save the screws and the small push button which activate the device. You'll find all of the electronics on a small circuit board near the head of the zapper. Two small wires extend from the board to the head. One of these wires goes to the inner web of the racket and the other to the outer. We won't be zapping any bugs, so you can remove the entire head. Use the screwdriver to pry apart the halves, exposing the wires inside. Clip the wires, leaving enough lead to solder new wires for our tool. One wire will go to the sieve and one to the layout, but that will come soon. Next, we turn our attention to the sieve. The kitchen sieve will be used as a hopper to apply the grass material. It must attach to the handle of the zapper in place of the zapper head. Remove the plastic handle by unscrewing, prying, or any means necessary. The remaining metal handle must then be cut to length. Use a heavy metal cut-off disk in a motor tool to cut the bars to length. You'll want the hopper close to the handle, but it doesn't need to touch. Cut the handle so that the bars stop short of the circuit board. This metal will have a charge when the applicator is in use. Two wire leads must be attached to the exposed wires on the circuit board. One only needs to be a few inches long and will attach to the sieve. The other should be about eighteen inches long and will be attached to the ​scenic base of the layout with an alligator clip and a small nail. It does not matter which wire goes where. Solder the wires to the leads. Once the wires are attached, protect them with electrical tape or shrink tubing. If the metal sieve contacts the wire to the layout, you could damage the tool or even shock yourself. This next step will take a little trial and error. To get a reasonably tight bond between the sieve and handle you will need to add a few shims from scraps of basswood. Experiment with whatever you have in the scrap pile. Use electrical tape to help secure the shims and the sieve. The two wires must also be routed out of the handle. Be careful not to pinch these. Reattach the top of the handle. Tighten the screws and if necessary for added strength (or just to make the unit look better) wrap the handle in tape. All that remains is to finish the wires. To finish your grass applicator, attach the short wire to the sieve and install an alligator clip on the long wire. Strip a small amount of insulation from the end of the short wire and thread it through the screen. Solder in place for a secure bond. Solder and/or crimp the end of the long wire onto the alligator clip. Just put in the batteries, and you are ready to start planting grass.